Belmont Estate is a cacao plantation that dates all the way back to the 17th century, where the cacao today still receives ancestral traditions in its harvesting, fermentation, drying and handcrafting its chocolate. Belmont Estate harvests its cacao by sniping the colourful pods off the trees using mitten-shaped cocoa knives. Once fermented the beans are placed outside for 6 or 7 days to dry in the sun on big wooden trays or in our solar/convection drying facility built by the late Mott Green of the Grenada Chocolate Company. 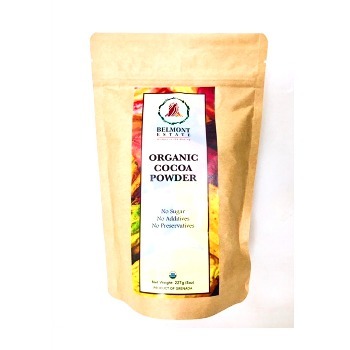 This product is 227g of pure cocoa powder, pressed by Belmont Estate.